How Robin Campillo’s BPM gets queer AIDS activism right. Adèle Haenel as Sophie in BPM (Beats Per Minute). 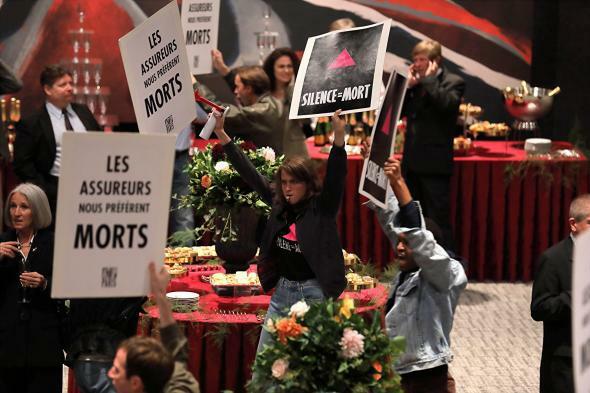 For a year and a half, to plan or just hear about actions (never “protests”) like that one, I went to a meeting very similar to the ACT UP meetings that frame BPM (Beats Per Minute), the fantastic, Cannes Grand Prix–winning French film directed and cowritten by former ACT UP member Robin Campillo. Though the film’s meetings were in Paris and mine were in Boston, and though I actually attended Queer Nation, an ACT UP offshoot that shared its parent’s structure but focused on homophobia, watching BPM was like being back in those rooms. Critics have been rapturous about the film’s portrayal of community resilience and the survival of romance in the face of the plague, but I’d like to add one additional note of praise: It’s the best fictional representation of the very real activism of those years that you’ll ever see. The nitty-gritty of organizing is perfectly rendered. Before the film’s first ACT UP Paris meeting, we overhear an introductory explanation of the ground rules: no clapping or cheering, which subtract precious time from the meeting; only snapping to express approval (very frustrating for those of us who couldn’t snap); hissing to express disapproval. The facilitators of the meeting were always one man and one woman (and unlike in the film, usually alternated between several members). Facilitators gave the timeout signal when a speaker from the floor needed to wrap up, though invariably one person, usually the same one every week, would talk well after repeated signals and exasperated stares. The film manages to capture a paradox that I often have trouble explaining to friends: The early 1990s were terrible for queer people—I regularly saw the obituaries of the people with AIDS I took care of in my day job just months or weeks after I’d first gotten to know them. And even so, a lot of us activists still had a great time, disagreeing with, flirting with, dancing with, and “dating” (sometimes only for one night) other politically minded queers. The music we danced to at clubs, either after an action or as a break from distributing—as in the film—safer safe packets at schools were from Deee-Lite, CeCe Peniston, and Crystal Waters. These were not the tracks we hear in Campillo’s discos, but we definitely felt the same abandon as the characters on the dance floor. BPM even captures the sound of motorcycle jacket–clad activists walking together, the rustle of leather and little clinks of zippers and buttons. The film also manages to briefly touch on why some of us left: the sexism a sector of men in the group exhibited toward women. The men in my group didn’t have to call us names to show how little they valued our work. A few of us who had been very active left together. Two of them went on to cofound the Irish American Gay, Lesbian, and Bisexual Group of Boston (GLIB), an organization that was in newspapers and on TV for years due to a Supreme Court case over being allowed to march in the Boston St. Patrick’s Day Parade. In the end, the element of ACT UP–style activism that BPM managed to capture most beautifully is how it could make you believe in the almost miraculous power of collective action. Of course the denizens of ACT UP Paris thought they might be able—as they film imagines but the group never actually accomplished—to turn the Seine river red as blood. Once you see a large mass of people mobilize in an action you helped plan, no matter what setbacks and failures have happened along the way, you begin to think that anything is possible.